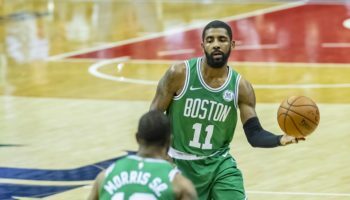 BOSTON — Life as the prohibitive Eastern Conference favorites sure can be stressful, hence why certain members of the Boston Celtics have emphasized over the past few days to make sure to keep in mind that the game of basketball, first and foremost, should be about having fun out on the court. From there, the execution — and the winning — should follow. At the moment, the Celtics are scoring for fun during their best stretch of the season. Kyrie Irving headed the laughs, err, the team tonight with 22 points while Jaylen Brown marked his return to action after missing three games with 21 points off the bench as Boston defeated the New York Knicks 128-100 on Thursday, extending their win streak to a season-long four games. In each of the Celtics’ four wins on the trot, they have scored at least 115 points, the first time the franchise has scored at least 115 in four consecutive games since December of 1990. The impressive 6-2 start that the Celtics raced out to this season quickly devolved into a distant memory just a couple of Saturdays ago, when a loss in Dallas completed a 3-6 stretch and plunged Boston back to the .500 mark, increasing the stress of the players and anxious fan base alike. Since then, a few things have changed with the team, most notably the Marcuses (Smart and Morris Sr.) being inserted into the starting lineup together. The pace of play from the Celtics has picked up considerably and, with Gordon Hayward getting more comfortable with his role coming off the bench, Boston has looked reinvigorated. They look like the team ready to assume the throne of the Eastern Conference’s best. Almost as important than anything else, Boston looks…happy. 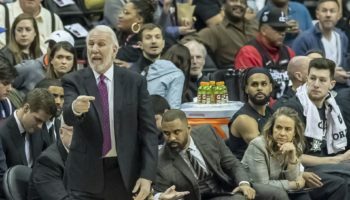 “I think I said it in the last media session we had at practice, just a different identity,” Irving said in describing the difference between the team now and the team that lost to the Knicks during their poor run of form on Nov. 21. “For us, we’re just having a lot more fun, making sure that we’re paying attention to detail and to make sure we’re playing at a level that we all demand out of each other. The joy and the execution were present once more tonight, as Boston hit 10 of its first 14 field goal attempts — including Irving hitting a couple of showy step-back jumpers and a long pull-up three — on its way to posting a 38-point first quarter. Nine of those points came on the fast break. “[Our pace] definitely puts us in a better position,” Irving said. 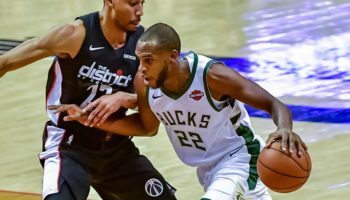 “It creates opportunities that we don’t have to generate a half-court offense and it just forces the defense to be on their heels for most of the game. 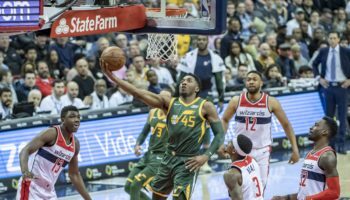 “I think we’ve been doing a great job of just trusting each other, having everybody touch the ball in certain possessions, being aware of what the defense is trying to take away from us and just taking away our mismatches,” Irving continued. Having a full compliment of players also helps to have more fun on the court, and Brown, who missed the team’s last three games due to a lower back bruise, barely missed a beat in his return, mixing up perimeter jumpers with attacking the basket relentlessly. His 21 points came in just 25:12 on the court as he also attempted nine free throws, making seven. 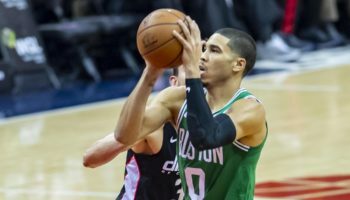 Though Boston never trailed in the contest and opened up a lead as much as 15 during the third quarter, New York turned the game’s momentum into a see-saw affair, as Tim Hardaway Jr.’s three with 3:49 remaining in the third quarter capped a 19-12 run and cut the Celtics’ lead to 89-82. Then that fun-loving Kyrie happened again, hitting a three-pointer on the next possession to give Boston a double-digit lead once again, and the margin never dipped below double digits for the remaining of the game as the Celtics scored 10 of the final 12 points of the third to effectively end the competitive nature of the contest. But when the fun and games have needed to cease and it is time to close the deal, Boston has done a better job in the past two weeks in keeping up their level of play throughout to close out games. Boston should continue its ascent up the Eastern Conference standings going forward, as long as the moments of levity continue to match the competitive drive.